2018 was filled with a plethora of retros, new silhouettes, collaborations and many releases-turned DIY projects in the footwear industry — Virgil Abloh continued his collaborative dominance with Nike; adidas breathed new life into its nostalgic catalogue and kept Kanye West’s “everyone will get YEEZYs” promise alive; we also saw PUMA re-enter the basketball market and snag DeMarcus Cousins from the Swoosh. Even luxury fashion houses sprinkled some streetwear into their own offerings – seemingly obsessed with the bulky sneaker craze – as Balenciaga, Gucci, Louis Vuitton, Versace and others have contributed their own footwear offerings. In addition, hiking footwear saw a purpose outside of adventurous trails and made their way onto runways. As we continue to ease into a new year, brands and designers begin with a clean slate. Here’s what we can expect in 2019 in terms of footwear trends and predictions. 2018 saw a growing selection of brand new silhouettes and we’re hoping that continues in the new year. Though it’s always exciting to cop your grail or relive childhood memories through retros, new innovations will always keep the industry alive and thriving. Last year we were introduced to models such as the YEEZY 500, Nike Air Fear of God 1, PUMA Clyde Court and the Nike React Element 87 – just to name a few. 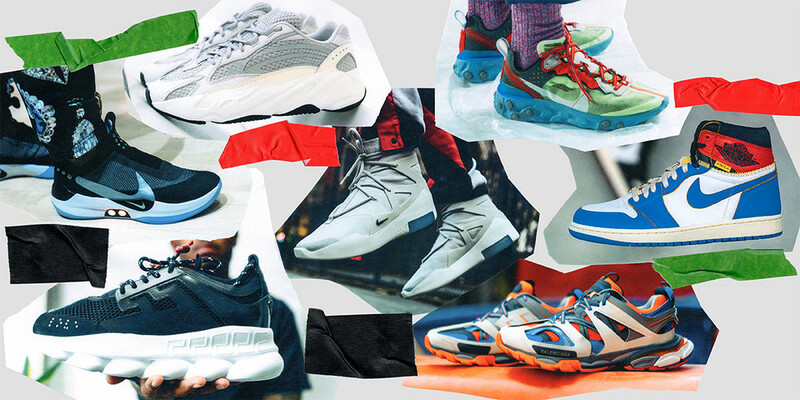 Moving forward, 2019 looks to bridge the gap between casual and performance models – clear examples are Russell Westbrook’s new Why Not Zer0.2, Nike’s Adapt BB and the trail/runway-ready Balenciaga Track Trainer, adidas’ Nite Jogger and the Swoosh’s new Air Max 720. Arguably his best model of the past few years, LeBron James’ 15th signature sneaker commanded the attention of footwear enthusiasts when KITH linked up with King James. This two-part batch of royalty-inspired releases would have all eyes glued to LeBron’s feet during 2018’s NBA All-Star weekend – a similar feeling shared back in 2012 when Nike launched its galaxy-influenced models. This same emotion was one that Jerry Lorenzo thought the industry was lacking while developing the Nike Air Fear of God 1, a sense of validation Michael Jordan fans longed for prior to unboxing their first pair of Jordans. Aside from the Nike Air Fear of God 1, 2018 saw basketball-ready models receive a significant amount of fashion forward co-signs and makeovers. Damian Lillard’s fourth signature sneaker with adidas donned BAPE’s signature camo pattern while Y-3 ushered in a James Harden-inspired BYW BBALL sneaker. Virgil Abloh applied the signature Off-White™ zip-tie and industrial stamp to the Nike Hyperdunk as well as UNDEFEATED applying its own camo pattern to the Nike Kobe 1 Protro. With the Fear of God x Nike mashup being the most recent of the bunch, Russell Westbrook’s new Why Not Zer0.2 sneaker and forthcoming Nike Adapt BB look to revisit past days of basketball models being at the forefront of fashion releases. One of the strongest trends recently, the “dad” shoe has dominated the majority of 2018 and looks to continue in the new year. Though a few lines capitalized off the movement with out-of-this-world designs – such as Versace’s Chain Reaction – and (some) affordable price points, hiking-inspired silhouettes may be taking the place of the aforementioned craze. Appropriately, Balenciaga’s Triple S sneaker has been matched by its own multi-layered Track Trainer along with 1017 ALYX 9SM already having a selection of hiking-influenced models in its catalogue. Though it isn’t expected for this fad to see an overnight shift, ugly-yet-attractive sneakers are seemingly expanding its options under the hiking category. 2018 was surely a strong year in women’s footwear. Voices were shouted and brands finally listened to their calls over the years with demands such as smaller sizing for the most anticipated releases, exclusive collaborations and higher representation in the industry. We also found some of the designers and influencers behind this women’s movement voicing their thoughts on sneaker panels throughout the year. From Nike’s M2K Tekno to the Kylie Jenner-endorsed adidas Falcon, women such as Aleali May, Stella McCartney, Rox Brown, Serena Williams and more are only a few that have made major impacts in footwear with 2018 seemingly being just the tip of the iceberg. Share some of your favorite sneaker moments of 2018 and let us know what you hope to see in 2019 along with what you’d hope to stay in 2018. In related footwear news, you can browse through few releases slated for this year’s All-Star weekend. © 2017 Barbara King Styling. All rights reserved.